Apparently trying to drum up anticipation for the release of Fable 2, developer Lion Head has spewed forth this mini-collection of minigames. While designed to be passable time-wasters, these three games, including Keystone, Fortune’s Tower, and Spinnerbox also have a nefarious hook: money you earn in these promo games actually carries over when you buy and play the full Fable 2 game, so you can start out already rich. A game of almost pure luck, Fortune’s Tower shouldn’t be nearly as much fun as it is. It’s a straight card-drawing game, with each fresh draw offering more cash but a higher chance of failure. It’s deliciously nerve-wracking as each line reveals itself. Unfortunately, someone discovered anexploitthat allows you to get rich way too easily. Hopefully this problem will be fixed soon. 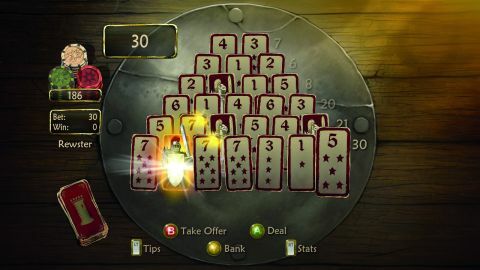 Spinnerbox is Fable’s fruit machine, minus everything that makes fruit machines fun; and fruit machines aren’t much fun anyway, so as you’d expect, it’s the weakest of the bunch. No holds, no nudges- just a tap of the A button and a spin of the discs; matches score, odd symbols fail. That’s about it. Ignore, unless you’re a serious, mental gambling addict. Overall, Fable 2 Pub Games is a very expensive package, but the rewards in the wider world of Fable 2 could be great. It’s essential only for players who plan on spending a lot of time with the full game. Description Fable 2 Pub Games is a very expensive package, but with two fun and addicting games out of three the rewards in the wider world of Fable 2 could be great.